Black or dark skin is actually fairly common in mammals. It's a useful trait with many and varied purposes, from concealment to sunscreen to social standing. Dark skin and a dark hair coat often go together, but not always. White on top, black underneath -- that's the polar bear. Actually, he's not white; he's no color at all. 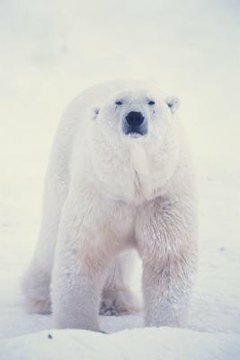 Every individual polar bear hair is a clear tube that appears white because of light refraction. This peculiarity of his fur allows sunlight to reach his dark skin, which absorbs some warmth from it. This is one of a combination of adaptations to cold that allows the polar bear to reign supreme at the top of the food chain at the top of the world. Marine mammals of the pinniped family -- pinniped means fin-footed -- live in all the oceans of the world and some freshwater lakes. Seals, sea lions and walruses once lived on land, but returned to the water and developed fin-like flippers instead of arms and legs. Some have a white coat for a short time after birth, but underneath the pelt is dark skin. This ranges from purple to gray to dark brown, regardless of what color fur they have as adults. The almost hairless walrus can even turn pink after a sunbath on shore, when the blood flow, restricted in the water to conserve body heat, returns to the skin. The horse in striped pajamas known as the zebra has a black-and-white pattern, but underneath all that jazz is basic black. The short, shiny hair of the zebra's coat reflects almost 70 percent of the heat of the sun in his savanna habitat, and the dark skin under it prevents too much ultraviolet light from reaching his body. If you look closely at the plains zebra, you'll note that his black stripes tend to be wider than his white ones, but the overall pattern breaks up his outline when he stands still and dazzles when he moves; this helps him avoid being noticed by lions who'd like to eat him. The shy and secretive gorilla has both black skin and black hair, allowing him to fade into the shadows of his jungle. The chimpanzee, on the other hand, is usually born with pale skin; some chimps retain this coloring into adulthood, making them look almost human. In other primates such as the baboon, adults have dark skin, while babies are born color-coded, with bright pink skin and black hair. As long as they wear this color scheme, so different from the adults, they can get away with any mischief and the grownups either play with them or just ignore them. When they graduate to juvenile status and start to change to adult wear, however, the swift hand of discipline comes into play and they can get smacked for doing what they did while they were infants. In What Countries Is the White Tiger Found? What Is the Difference Between Zebra and Tiger Stripes?